Trumpish messages slipped into Sinclair Broadcasting news reports are the latest reminder of why America needs to limit media consolidation. After years of media consolidation, Americans are seeing the downside of conglomerates controlling most of the nation’s news organizations. 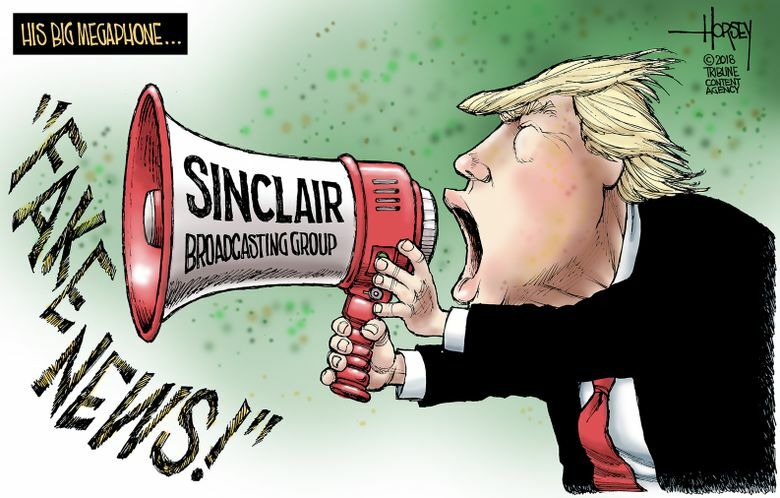 The loss of diverse, independent news outlets leads to situations like Sinclair Broadcast Group, the nation’s largest TV broadcaster, using local stations to air messages echoing President Donald Trump’s “trust me, not them” attacks on the media. Sinclair has the right to manage its stations and air political views. But using local news anchors to recite such material undermines the credibility of reporting by Sinclair and the media in general. The public has a hard enough time nowadays distinguishing between objective, factual news and partisan “news.” Blowback against Sinclair’s latest move suggests people in this time of heightened news interest are fed up with efforts to further blur the lines. This comes as Trump continues attacking the media working to hold him accountable and inform voters about the performance of his abnormal administration. Sinclair’s Trumpish message also coincides with Sinclair seeking federal approval for its $3.9 billion takeover of Tribune Media. The deal would expand its reach from 173 to 215 stations reaching 72 percent of households, though it may have to divest some stations. The Federal Communications Commission is scrutinizing the merger, and its inspector general is examining whether Trump’s chosen FCC head, Ajit Pai, improperly changed rules to benefit Sinclair. Even so, the merger is expected to be approved, especially with Trump signaling support of the Maryland-based broadcasting giant. Citizens on the right and left should be concerned about these machinations and the underlying threat to democracy. Elements of the message that Sinclair delivered are correct. Yes, its local news teams strive to do good work, the public needs to be skeptical of information shared via social media and some media outlets are indeed partisan. But fomenting general distrust of “the media” harms the social fabric and democracy. The media isn’t perfect but news organizations that strive for objectivity are needed to inform voters, hold government accountable and empower people and communities with shared knowledge. Sinclair has a long history of using its extraordinary reach to distribute partisan messages, including the notorious “Swift Boat” hit pieces aired during John Kerry’s 2004 presidential campaign. More recently, it reportedly formed an alliance with the Trump campaign in 2016. Especially ominous is hearing the nation’s largest broadcaster deliver a scary attack on media echoing Trump, who is frighteningly sympathetic to authoritarians who maintain power by neutering the press. In years past such broadcaster activity might be subject to scrutiny by the FCC. The agency was originally charged with ensuring that companies using public airwaves were in return serving the public interest. They also had to abide by a fairness doctrine that called for presenting both sides of political issues. “Boy have we lost sight of that in recent years,” said Michael Copps, a former FCC commissioner. The fairness doctrine was phased out starting in the 1980s and formally ended under President Obama’s watch. Ensuring public interest is complex, because the term is ambiguous and Congress failed to provide clarity after establishing the Communications Act in 1934. Now would seem to be an opportune time to update and affirm the FCC’s role in ensuring broadcasters are serving the public interest, given concerns on both the right and left about their performance. Clear standards for those using public airwaves should also defuse Trump’s complaints about network news. This would complement net-neutrality regulations that are needed to protect the public interest on newer telecommunication platforms, by ensuring the internet remains an open, level-playing field. Observers say there’s little chance of such reforms in the near term. But the public should be aware that a regulatory framework and tradition exist to prevent an Orwellian media future, by limiting further consolidation, restoring net neutrality regulations and strengthening public-interest standards for broadcasters. Sinclair’s shenanigans are the latest reminder that such guardrails are needed to ensure that Americans continue to be informed by a diverse, independent and free press.